151 pages | 38 B/W Illus. 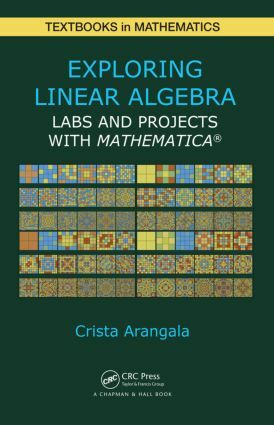 Exploring Linear Algebra: Labs and Projects with Mathematica® is a hands-on lab manual for daily use in the classroom. Each lab includes exercises, theorems, and problems that guide your students on an exploration of linear algebra. The exercises section integrates problems, technology, Mathematica® visualization, and Mathematica CDFs, enabling students to discover the theory and applications of linear algebra in a meaningful way. The theorems and problems section presents the theoretical aspects of linear algebra. Students are encouraged to discover the truth of each theorem and problem, to move toward proving (or disproving) each statement, and to present their results to their peers. Each chapter also contains a project set consisting of application-driven projects that emphasize the material in the chapter. Students can use these projects as the basis for further undergraduate research. "The presented book provides readers with a set of interesting exercises and problems regarding linear algebra. The book covers the scope of an undergraduate course … excellent supplementary material for a linear algebra course …"
Lab 10: Declaring Independence: Is It Linear?